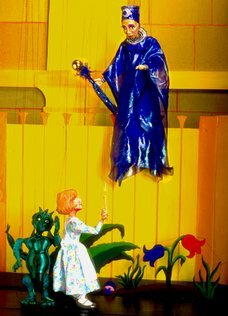 In this delightful and fun-filled journey through Mozart's Magic Flute, the cast of almost two dozen marionettes brings Susan Hammond's award-winning story to life much to the delight of young and old alike. Mozart's Magic Fantasy has won every conceivable award for excellence in children's music including the prestigious Parents Choice Award for Best Children's Work, the Juno Medal of Excellence, and the American Library Association's Golden Award for Excellence. In addition to the regular Magic Flute characters the "Fantasy" piece adds a young girl, Sarah, and a 'not too frightening' dragon. Sarah arrives at the opera theater one afternoon to meet her mother who is performing in The Magic Flute. Suddenly Sarah is swept up into the action on stage and begins a musical adventure of magical and wonderful proportions. All of the Mozart music in the work includes child-appropriate lyrics. Such characters as The Queen of the Night and Papageno the bird-catcher, always rate as audience favorites -- right behind the lovable dragon. "It is a great piece to work with," says theatre General Director Ted Leach, "because the public can purchase the recording beforehand and are thus fully prepared as the story unfolds on our stage. Many, many of our ticket orders also include a request for the soundtrack to be mailed in advance," Leach adds.